From the streets of cities like Osaka and Tokyo to the awe-inspiring slopes of Mount Fuji, half marathons you can run when you travel to Japan in 2019. Held in early February, this race takes place in the northeast of Shikoku Island, between the Sanuki Mountains in the south and the island-dotted Seto Inland Sea in the north. The out-and-back course starts and finishes at the Pikara Stadium and runs parallel to the water for most of the race, passing over the Doki River and running through Taosaka Park. The loop course of the Minami Uonuma Gourmet Marathon is flat and fast. Held in the west coast city of Minamiuonuma, the early June race starts and finishes in Yanoronomori Park. Hopefully running 13.1 miles will work up an appetite, because as a participant you can enjoy an original meal bowl and meal ticket that you can use at the Konoshima Koshihikari All-You-Can-Eat gourmet village. The out-and-back course of the 13.1 mile Cabbage Marathon is full of elevation change. Runners start at the highest point with views of the campgrounds surrounding Lake Barragh. Over 2 miles in, the course then runs through cabbage fields for miles until reaching the turnaround point in which racers are treated to views of the mountains of Kanazawa. The Cabbage Marathon takes place in early July and has a 3 hour time limit. The Fuji Mountain Race is a half marathon distance that runs up Mt. Fuji. Taking place in late July, the course begins at 2,500 feet and climbs to 12,388 feet over 13.1 miles. Runners will enjoy spectacular views as they climb the mountain from Fujiyoshida City Hall to the summit. Be sure to dress in layers as the temperatures can vary 70° from the base of the mountain to the top. Approximately 2 hours southwest of Tokyo, the town of Yamanakako hosts the Yamanakako Road Race in late May. Runners will follow a loop course around Lake Yamanaka, going in a counterclockwise direction until reaching the start/finish area just beyond the halfway point. The course then follows an out-and-back section along the lake before returning to the finish line. Runners will have 2 hours, 30 minutes to complete the mid-May Fuji Susono Half Marathon. 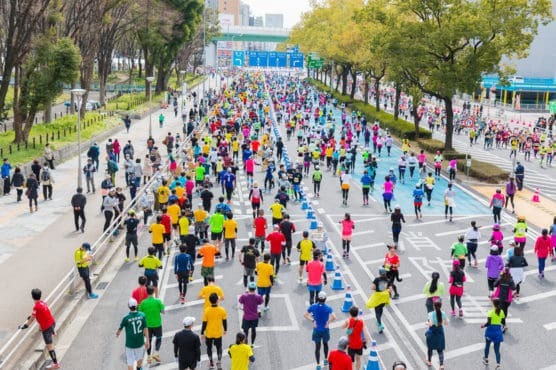 The course starts and finishes at the Susona City Sports Park Athletic Stadium and runners will follow the road out of the stadium until reaching the intersection near Ono Road. From there, runners will continue on to the Suuyama Post Local Area, down to Fuji Soaono Industrial Park, and down to Panorama Road before returning back to the finish.For details, refer to the arrow in the figure. The Narita Pop Run takes place in mid-November and offers runners 3 different race distances, a 3K, 5K, and a half marathon. The half marathon is a loop course that features rolling hills in the beginning and end, but is perfectly flat during the middle miles. Runners have 2 hours, 30 minutes to complete the course. On the northeast coast of the Japan, the city of Sendai holds the Sendai Half Marathon in mid-May. The course is an out-and-back style and features a gradual climb in the first 4 miles as runners go over the Ohashi Bridge and make their way to Nishi Park. Except for the last mile and a half, racers will enjoy running downhill throughout the second half of the course, finishing at the Sendai City Athletic Field. Karuizawa is a resort town in the mountains near Nagano and is the home to the Karuizawa Marathon in late May. The 13.1 mile race runs along the main street of the old town center and to the beautiful villa of the nearby grove. The loop course is flat and fast and a beautiful place to set a new PR! Runners have the option of either a full or half marathon for the Osaka Yodogawa City Marathon. This early November race starts at the Yodogawa River Park and the 13.1 mile course runs along the left bank of the Yodogawa River, through the Horse Row Gate, and across the river to the right bank. Runners then turn back at the Yodo River Bridge and cross the Yodogawa Great Wall again before return back to the starting point. The riverfront course makes this half marathon flat and fast! Carissa Liebowitz has run the New York and Boston Marathons as well as dozens of marathons and half marathons. You can follow her running adventures on Strava, Instagram and her blog.